IMonitor EAM can not only monitor local printer, but also can monitor network printers that with a unique IP address. IMonitor EAM can save millions of dollars for a corporation in hardware, paper, and time. IMonitor EAM gives management an unprecedented power for the first time to analyze, when a printer is under- or over-utilized. Management can make an accurate forecast based on fact about printer utilization. Most office managers don't have an understanding of how many pages each employee is printing in a year or in a week. What time of the day the printer is used the most or what time of the day the printer is idle. Since management does not have the exact information of how many pages are being printed and who does the most printing, offices end up with over capacity. Office equipment suppliers routinely "over-sell" expensive high-end printers to their customers. With IMonitor EAM, one can quickly and precisely assess an office need and calculate the printer hardware needed for the office. Identifying printing habits of individuals or the office and allocating resources accordingly can reduce paper waste by eliminating reprints and identifying faulty devices. A defective printer with faulty paper feed can cost a lot for an office in wasted time and wasted paper because of frequent paper jams resulting in reprinting. Some additional benefits of IMonitor EAM are document print monitoring for auditing. Law firms and accounting firms can use IMonitor EAM to	monitor which document is printed, who did the printing, on which printer and when the document was printed. IMonitor EAM will collect information about the printing on the fly. The information is transmitted, by the transport module, to IMonitor EAM Server through TCP/IP. IMonitor EAM Server can collect data from one or more computer. Finally all data is stored in a database. Periodically reports can be generated from the database to view the utilization of a printer during a time period. The system administrator can see which printer was used in a given time period, which documents were printed to that printer and how many pages that printer has printed. You can even see which documents have been printed by a specified user during a certain time period, or how many pages a user has printed. 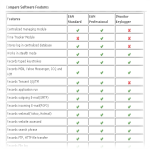 IMonitor EAM completely supports IP Printers. Since IP printers connect to the PC through a network, the IP printer could be at a different physical location than the PC that has the drivers installed. Regardless of the physical location of the IP printer, IMonitor EAM can still monitor the IP printer by installing the client on the PC where the printer driver for the IP printer is installed.